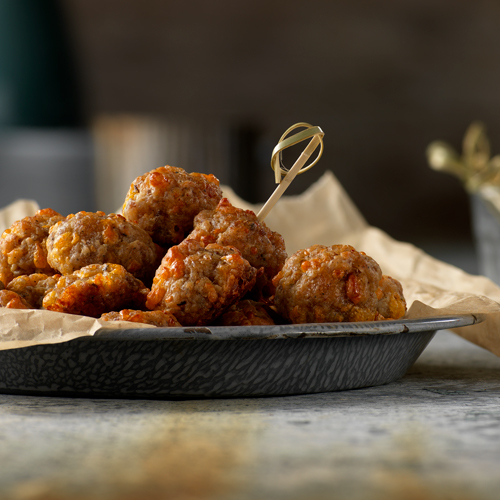 A simple classic sausage cheddar ball recipe with only three ingredients. Great as appetizers or for breakfast! Preheat oven to 375° F. Combine sausage and cheese in large mixing bowl. Blend in baking mix with hands until well mixed. Roll into 1-inch balls and place on ungreased baking sheet. Bake 10 to 15 minutes or until golden brown. Serve warm or at room temperature. For an easy dipping sauce, combine 1 cup of apple jelly and ½ cup yellow mustard. Heat over medium heat until combined.